Select fuel prices as of May 4, 2016, in Largo,. FL. RVers can expect an average of 2.04 per gallon for regular gasoline for Summer 2016. The summer traveling season is looking very positive for RV enthusiasts as the price of gas and diesel are expected to stay at some of the lowest levels than we have seen in quite some time through to 2017. RVlife.com spoke to the U.S. Energy Information Administration (EIA) recently to get a keen look at what lies ahead and there is nothing but positive news for RVers who will be hitting the pumps while on route to their destination this year. 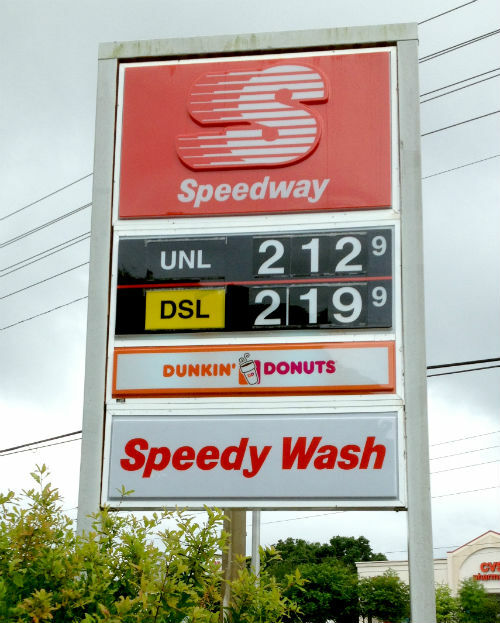 In fact, the EIA’s April-2016 Short Term Energy and Summer Fuels Outlook forecasted that motorists can expect an impressive average of $2.04 per gallon for regular gasoline, which is a decrease of 59 cents per gallon over the average price in the Summer of 2015 and the lowest average price since the Summer of 2004. Hill also explained that the price of diesel for consumers is at its lowest point in ten years due to this past mild winter and as a result, inventories of diesel have been higher than normal throughout 2016 and the last part of 2015. When hitting the road this summer, also expect to see fuel prices fluctuate in various areas of the U.S. as the EIA forecasts that summer averages will be as low as $1.80 per gallon on The Gulf Coast and up to $2.51 per gallon on the West Coast. Except in California! Prices are rapidly approaching $3/gal here and do not seem to be slowing down. That’s another reason I avoid California and don’t live there. Oregon is bad enough!???? Even with a very favorable exchange rate, prices for diesel in Mexico are approaching $US3.00/gal. ULSD (ultra low sulfur diesel <15ppm sulfur) is not available below the border cities until you get close to Mexico City. The ULSD has about 97% less sulfur than LSD and cars, trucks, RV with diesel engines built after 2007 may suffer emission control damage with the normal, low sulfur diesel. Check with your engine manufacture before heading south. Tourist season in the Black Hills and that means “soak-em”. Fuel prices climbing rapidly. You definitely won’t see those low diesel costs in Idaho, at least not in the Boise area. Maybe 4-5 months ago but not today. I filled up this AM and paid $2.59.9 a gal. .
Idaho always seems to be on the high side of most other states, especially eastern Idaho. If you’re going through the eastern part of the state it’s normally a good idea to have enough fuel to keep on going through that part of the state if possible. No way around it that I can see, If you drive you’re stuck with bloated prices whatever they happen to be at the time.